Allows easy access and visibility to all types of media? 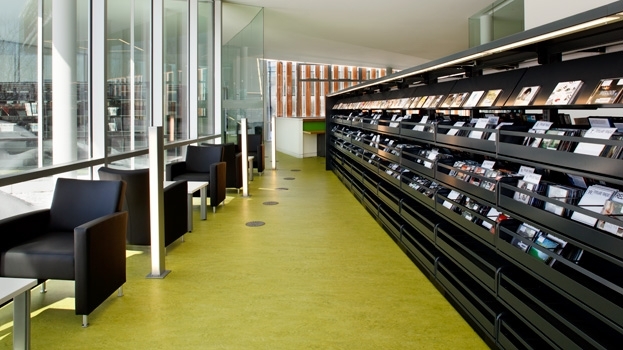 Is versatile enough to handle different sizes and shapes all within the same shelving system? Can be quickly and easily expanded to meet your growing needs? Has been proven to be successful in countless industries, including healthcare, education, libraries, museums, and government? 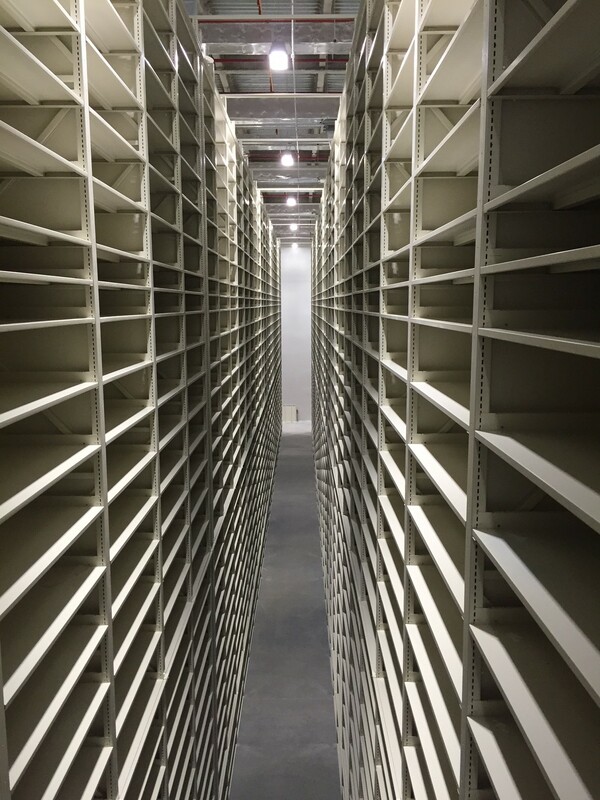 Trust Storage Systems USA to help you chose the exact shelving system that is right for you. 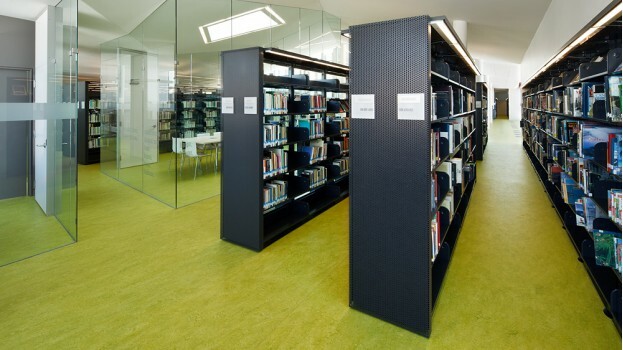 SmartShelf® also gives you the option of mixing and matching configurations. There’s no need to choose between full-depth and back-to-back shelving. You can have your cake and eat it too—an option that is absolutely exclusive to this product. 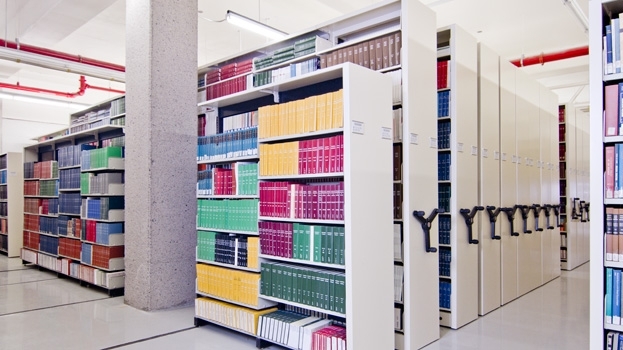 The hybrid four-post system permits both kinds of shelving at once: either 16-inch back-to-back shelving separated by a central divider, or 32-inch full-depth shelves. This is great for efficiently storing both larger and smaller items within the same unit, on full-depth and back-to-back shelves respectively. The advantages don’t stop there. There are all sorts of handy permutations you can introduce, such as hooks and supports, drawers and covers for added security. Make fine adjustments to your shelves’ height to match items of varying sizes. For more mobility and capacity, mount units on one of Montel’s mobile mechanical or electrical carriages. When it comes to storage, Aetnastak is the reference. 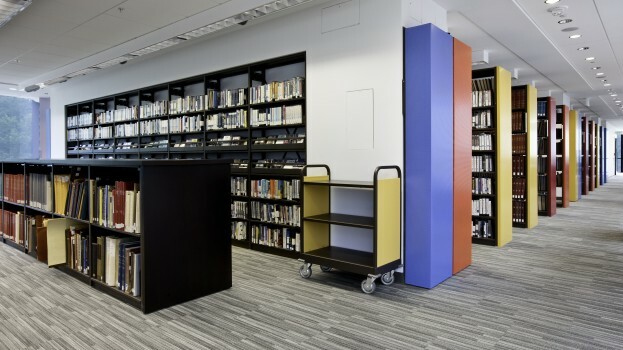 Libraries of all kinds have trusted their collections to this exceptional compact cantilever shelving system for over 50 years. Why? Because it can handle books from A to Z, whether in a public, corporate, medical or university library. And since libraries these days are about much more than books, it’s also perfectly capable of storing files, CDs, DVDs and other materials. 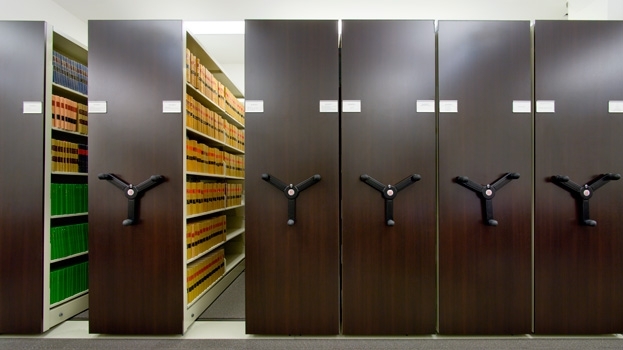 Besides looking after your library’s immediate shelving needs, Aetnastak is also an inspired choice for dealing with your future storage requirements. 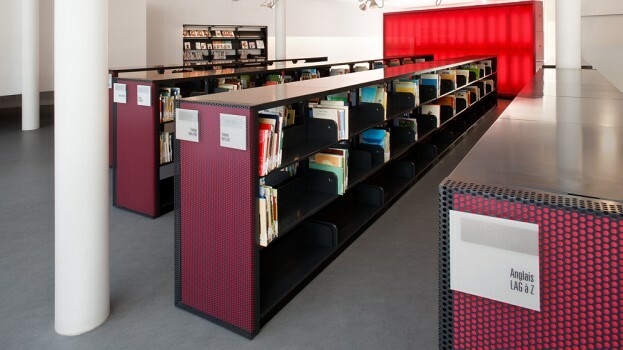 The compact cantilever library shelving system can be reconfigured time and again to perfectly suit your preferences. It’s no trouble at all to lengthen, shorten, relocate or attach existing units—all without the complications of added parts. Transform shelves from single-faced to double-faced (or vice versa) as the situation demands by adding or removing shelves on one side. While Aetnastak itself is stationary shelving, it can be mounted on one of Montel’s manual, mechanical or electrical mobile systems to get more out of your storage space. 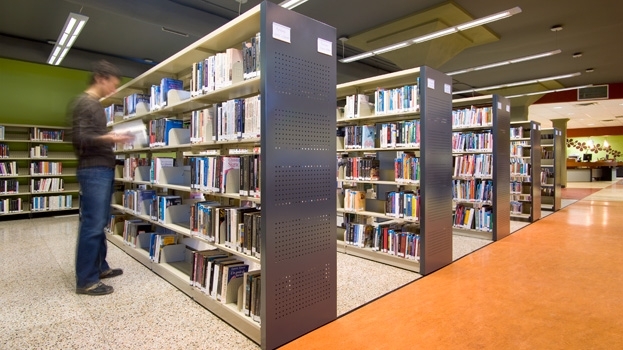 Whatever configuration you use, you can count on Aetnastak cantilever library shelving for sturdy support. The rock-solid welded frames are built for lasting strength and rigidity. The shelves surpass industry standards, giving you all the capacity you could ask for at 50 lbs per linear foot or 244 kg per square meter. Aetnastak is trusted internationally by renowned institutions, which employ the system for vital tasks such as storing rare, fragile and valuable books. You too can trust Aetnastak® to give your books—big or small, light or heavy—all the support they need, both today and tomorrow. 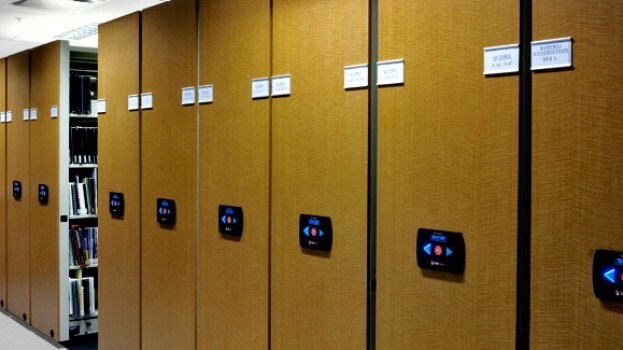 With high-density powered mobile storage systems, getting the most out of your space is a key consideration—but guaranteeing safety is also a must. SafeAisle will put your mind at ease on both counts. Its LED Guard Technology™ and other measures are aimed at providing the utmost in storage security. Here’s how it works: SafeAisle is equipped with detection cameras that monitor the entire floor surface of an open aisle, unlike many other systems, which overlook certain areas. This 100% coverage ensures there are no missed corners. 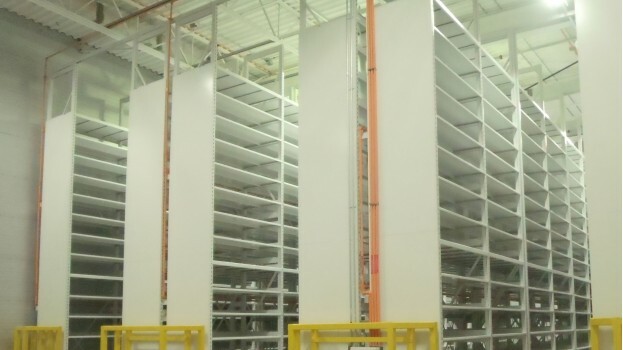 Whenever a person or an object—no matter how big or small—is in the aisle, built-in safeguards automatically prevent the powered mobile storage system from being moved. This cuts down on the risk of personal injury or property damage. 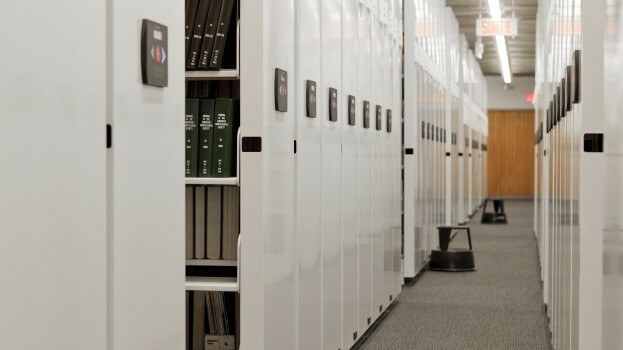 Every organization has unique storage needs that evolve over time—and they need storage systems that can keep up with them. With Mobilex, you can be sure your system can handle whatever you’ve got. 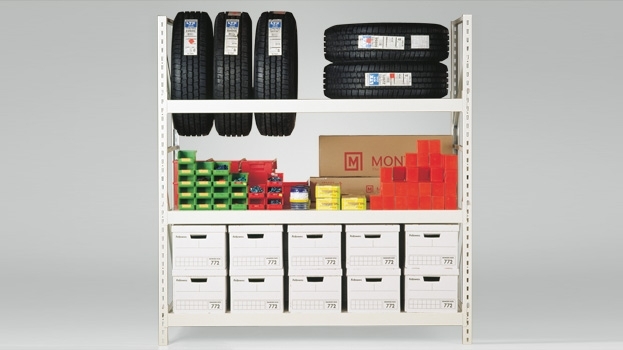 Available with both mechanical and electrical mechanisms, Montel’s signature high-density movable storage system gives you the flexibility to customize your shelving while optimizing your capacity. 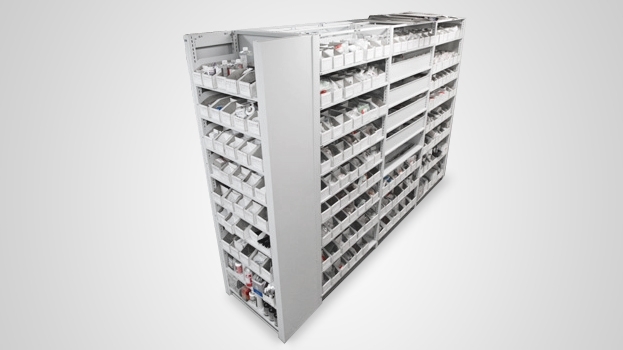 Whether mechanical or electrical, this cost-effective, high-density, movable storage solution is designed to accommodate various leading-edge Montel shelving products. 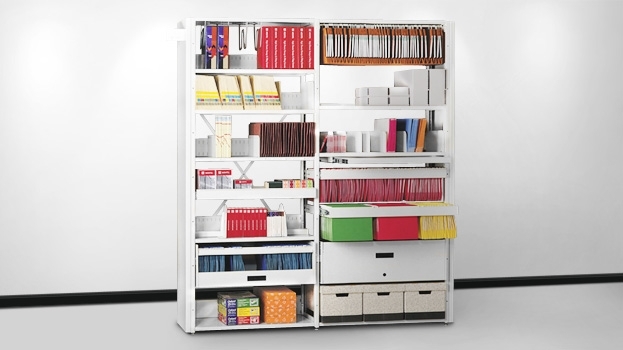 A wide range of accessories is also available: reference shelves, multimedia drawers, hanging files and more. Further customize your mobile shelving system via our broad selection of optional safety, security, design and aesthetic features. When it comes to storage that unites elegance and efficiency, Hybria offers you the best of both worlds. 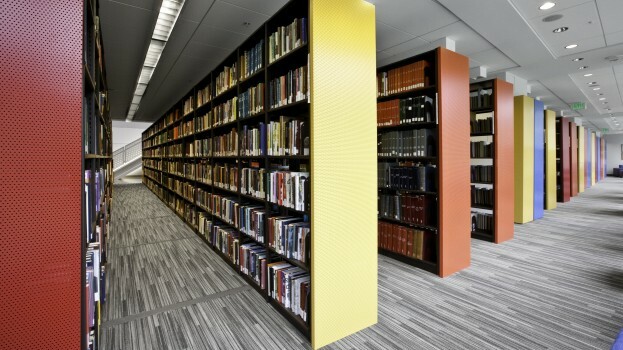 Featuring our unique four-post hybrid system, this shelving product combines the sleek appeal of Montel’s Aetnastak cantilever shelving for libraries with the practical efficiency of SmartShelf shelving capable of handling a broad array of storage objects. Inspired by contemporary European design, the Hybria is a smart two-for-one storage option that finally makes it possible to employ the advantages of the four-post hybrid system to shelve books—and since it has a more attractive look, you don’t have to keep it out of sight in a warehouse or basement. It’s a stylish solution for your library, archive, business or home. Just like the SmartShelf, Hybria’s four-post hybrid system enables you to configure your shelving in multiple ways: 32-inch full-depth shelves, 16-inch back-to-back shelves with a central divider or a personalized combination of both. What that means is you have the latitude to place larger and smaller items in the same unit; moreover, making adjustments to the distance between shelves facilitates storing objects with varying heights. And the beauty of this system is that it also contains the advantages of Aetnastak, which is expertly designed to manage books of all shapes and sizes. At the same time, it offers tremendous versatility due to its reconfigurable structure. The system can be mounted on Montel’s movable Mobilex and QuadraMobile carriages to further grow your capacity. No longer do you have to choose between books and other storage items, or between aesthetics and practicality. With Hybria or Hybria Curve, you can have it all. 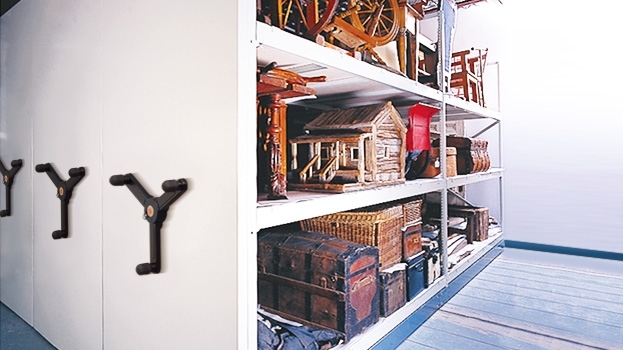 Not sure what to do with those irregular items that won’t fit neatly on normal shelving? Montel has the answer: 4D Wide Span shelving. 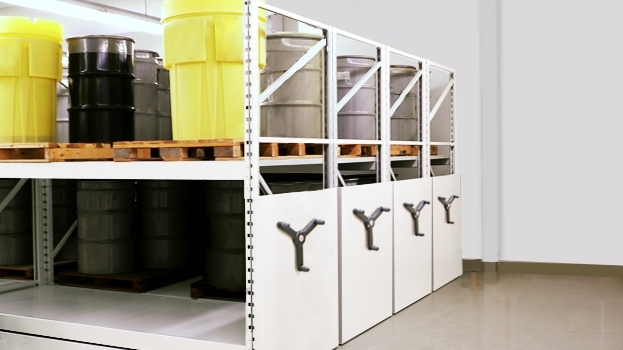 This long-span, four-post storage system is a wonderful solution for museums, warehouses and light industrial environments looking for somewhere to keep objects that standard storage products just cannot deal with. For objects of unusual height and width that are not too bulky, 4D Wide Span’s heavy-duty shelving is the perfect storage method. The inventive four-post long-span system will comfortably hold the likes of folded tables and chairs, museum artifacts, tires, rolls of electrical wire and mechanical parts. The semi-industrial shelving permits you 100% usage of the available shelf space, which is also conveniently accessible from both sides. 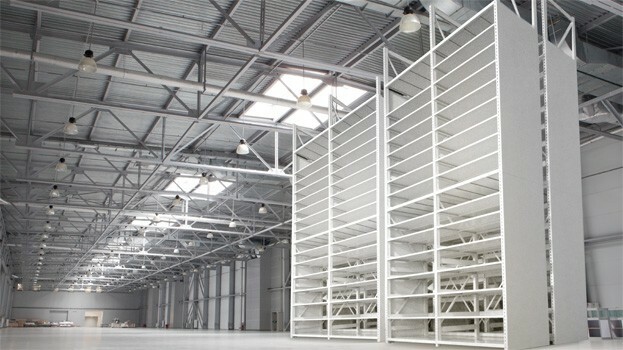 As a consequence, 4D Wide Span can help you increase productivity, save room and reduce costs by optimizing your storage. Plus, the system can be fixed in place or installed on Montel’s movable Mobilex® or RACK&ROLL 16 carriages if you’re looking to upgrade mobility and capacity. Boltless assembly facilitates installation of 4D Wide Span. 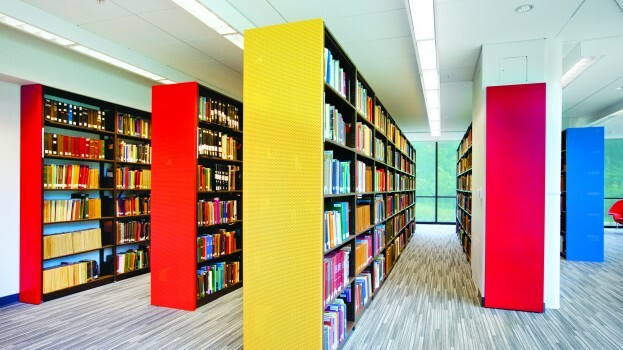 Drop-in panels can be inserted between the shelf beams, with an aluminum locking device ensuring that they are positioned correctly; larger objects may be stored directly on shelf beams without using the panels. Adjust the height of individual shelves to bring them more precisely in line with the dimensions of the items to be stored. While conventional filing and storage industry products often overlook unconventional storage items, Montel has not forgotten about them. 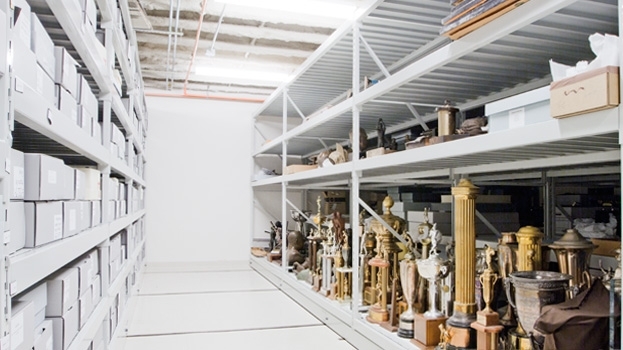 Our 4D Wide Span heavy-duty shelving system makes improved storage of irregular items a reality for museums, warehouses and light industrial environments. 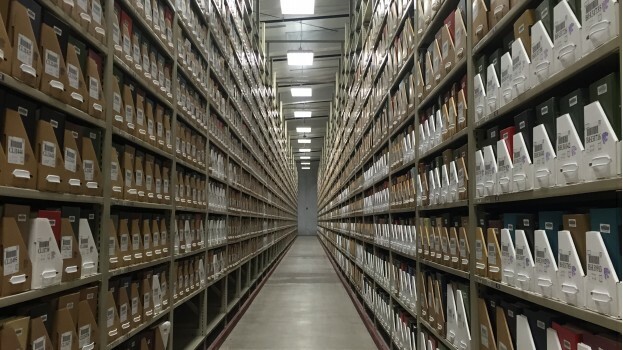 National, State, and Provincial archive record centers are more and more looking to store archival records off-site since they all have the same dilemma of running out of space. 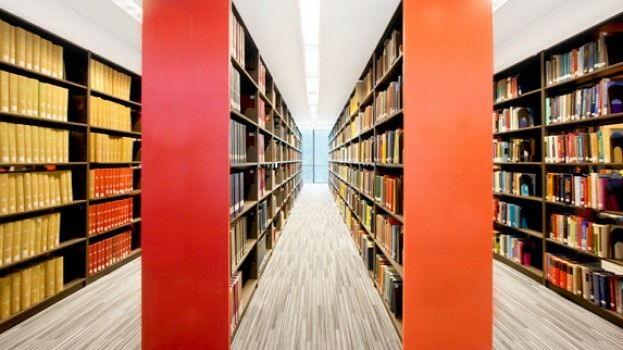 University libraries, public libraries, also have the challenge of keeping book collections in off-site book depositories. The public safety sector must also keep the courthouses legal case files. 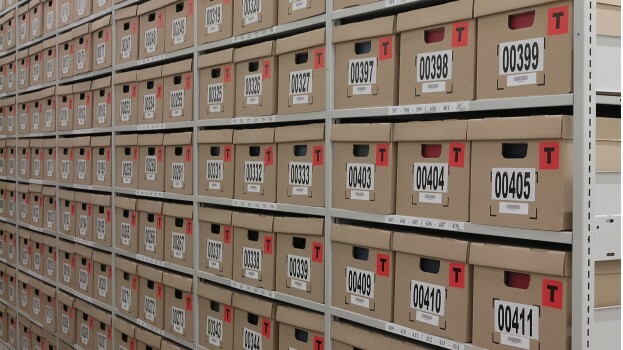 court records, and long-term evidence storage in off-site storage locations. 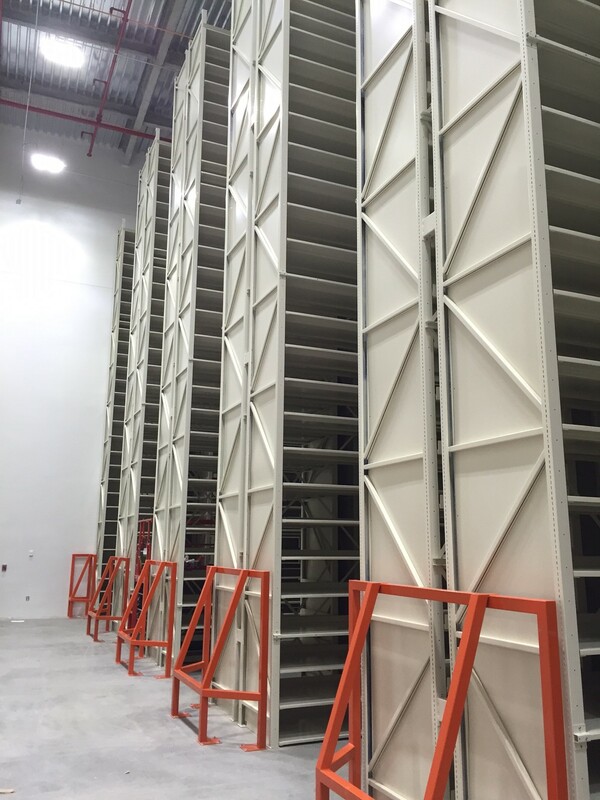 High-bay shelving systems are space-efficient, durable, stable, flexible, and compatible with other Montel shelving systems. Offers unique features for optimal flexibility and structural integrity. Compatible with SmartShelf® shelves. Shelves are easily adjusted and reconfigured on 1″ increments (25.4 mm) and do not require any tools. Contributes directly to individual LEED points as it conserves space and energy while obviously reducing your construction, operating and energy costs.